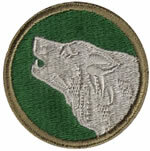 The National Timberwolf Association is revered by all of the sons and daughters of the soldiers of the Division. These Timberwolf "Pups" share a bond with deep roots and its membership has a vitality that together compels continuing the tradition of honoring the soldiers of the 104th Infantry Division and celebrating their accomplishments. It will be this Association's mission to ensure that future generations have an organization that is dedicated to keeping this important history alive and to honor its fallen. The Howl Vol. 8, No. 1 is en route to a mailbox near you and is available online here! Please enjoy the stories and updates included in our first edition of 2019.
of the 104th Infantry Division and the honors they have achieved. and our Last Bugle Call. 2019 NTPA Reunion in Warwick, RI. Register now before it is too late! Many thanks to all of our contributors! Timberwolf Tracks for only $30, including shipping. as well as recent Association news regarding the NTA and NTPA. The NTPA is honored to announce that copies of this wonderful collection of personal Timberwolf histories are for sale and readily available! in their very own words. The NTPA would like to thank our Veterans and the National Timberwolf Association for this generous offer! An Oregon State University Graduate Student, Mike Jager, joined us at the 2012 NTPA Reunion to interview and record the Oral Histories of our Timberwolf Veterans. Brigadier General T.K. Moffett and our Friends from Holland and Belgium are also featured in this brave project! They are posted on his Youtube channel or can be viewed on our Links and other sites page. The 16 (and counting!) videos can also be found by searching for "104th TImberwolf Division Oral History Interview" on Youtube. I think you will agree that an enormous amount of thanks are due to both our Veterans for sharing their experiences and to Mike Jager for preparing and sharing this essential body of work. Our appreciation knows no bounds. We appreciate your comments about our site. If you discover problems, please advise the Webmaster. Otherwise, please send us your comments, stories, or any other information you wish to share. Please do not send anything obscene or offensive.